have many expandable batons to choose from. 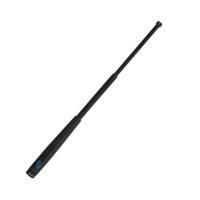 Monadnock®'s 21" UltraLite expandable baton is the brand's lightest friction lock design. Its carbon-graphite reinforced handle makes it up to 35% lighter than traditional expandable batons without sacrificing durability, making it easy to wield and comfortable to carry for long periods on duty. The black chrome finish prevents water damage and rusting and offers a professional look. The baton extends to full size with a simple flick of the wrist, and Morse taper locking joints ensure that it stays securely deployed while in use. The sound of the steel head deploying can often be enough to convince a subject to comply. Two end-cap options are available. The standard cap centers the end shaft over the retention spring, preventing spring breakage. The wedge end cap also enhances retention.